Photo: ARM Climate Research Facility. 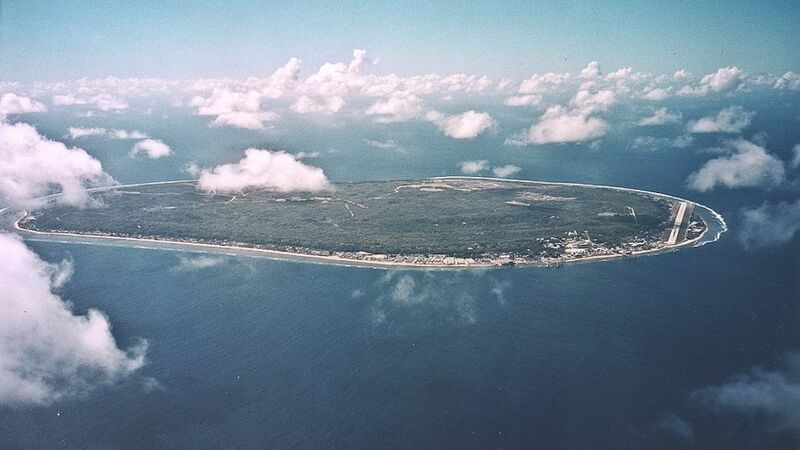 Last month I returned to Nauru, the smallest member of the United Nations and my home. The island is located in the Pacific Ocean close to the equator, about halfway between Hawaii and Australia. Our nearest neighbour is Banaba Island, 300 kilometres to the east. It is one of the most remote places in the world. I took the opportunity to talk to my community about some of the environmental changes taking place there, and it was a very troubling discussion. The sea around us is getting warmer, droughts have become commonplace, and the coastal erosion is as bad as anyone can remember. Similar trends are occurring across the Pacific and they have grave implications for the fish stocks we depend on for food, our freshwater supplies, and the very land we live on. Scientists have warned us that the situation will get much worse unless the greenhouse gas pollution responsible for global warming is dramatically reduced. Thus my government is acutely aware of the responsibility we face when we assume the Chair of the Alliance of Small Island States (AOSIS), as the endorsed Pacific candidate when the Chair rotates to our region late this year. AOSIS is a coalition of 43 islands and low-lying coastal countries from around the world that share similar sustainable development challenges and environmental concerns. The most urgent crisis we face today is climate change. Under Grenada’s leadership, AOSIS has consistently called on the developed world to cut emissions to levels that the science says will give all of our nations the best chance for survival. This is essential, not just because we are running out of time to take the action needed to avert catastrophe, but because, frankly, there has been a crisis of leadership among the world’s biggest economies in addressing the problem they are most responsible for creating. For example, some countries have still failed to commit to cutting emissions, while others have threatened not to renew their obligations at the end of 2012 when the first commitment period for emission reductions in the Kyoto protocol expires. It may seem ironic that the countries least responsible for climate change, and the ones most vulnerable to it, would be left to uphold standards of scientific integrity. However, the history of environmental conservation is replete with stories about people who drew a line in the sand against corporations and countries far more wealthy and powerful than them. AOSIS has taken such a stand when it has called for action based on what is necessary, not politically expedient. This will continue when Nauru is chair next year. In the meantime, the international community must make progress in the following areas, lest the crisis run away from us all. First, there must be a second commitment period for the Kyoto protocol. The agreement is the best available legal framework to address a global problem as complex and severe as climate change. Second, the targets set for reducing greenhouse gas emissions are not nearly ambitious enough to mitigate the worst impacts of climate change. In fact, new research shows that faster-than-expected loss of polar ice sheets could mean sea levels rise by more than a metre, which would put cities like New York and London at risk for severe flooding and inundate many of the islands in our region. Third, developed countries should establish readily accessible sources of climate funding once and for all. The agreement reached last year in Cancun included pledges of $100 billion a year by 2020 to help the developing world adapt to climate impacts and adopt clean sources of energy. That sounds like a lot of money, but to put it in perspective, it’s about one-third of the revenue of the world’s largest oil company in 2010. The World Bank estimates at least that much will be needed for developing countries to cope with droughts, floods, sea level rise, and other climate impacts — and it is still not clear exactly how the money promised will be spent. Our ability to find a solution to climate change will depend on the choices we make and the values we prioritise. It also depends on who we prioritise — the rich or the poor, the secure or the vulnerable, present generations or future ones. These decisions will determine whether the future sees a destructive scramble for the world’s remaining resources or an equitable sharing of steadily increasing prosperity. Because in the end, we all live on the same island, and how we treat it and each other will settle the fate of humanity. Ambassador Marlene Moses is the permanent representative to the United Nations for the Republic of Nauru. She lives in New York.